These 27 questions from the DVSA revision question bank cover the behaviour of other types of vehicles on the road such as lorries and buses. The average score for this test is 92%. Can you beat that? Cyclists, and motorcyclists, are very vulnerable in crosswinds. They can easily be blown well off course and veer into your path. Always allow plenty of room when overtaking them. Passing too close could cause a draught and unbalance the rider. Depending on relevant speed, it will usually take you longer to pass a lorry than other vehicles. Some hazards to watch for include oncoming traffic, junctions ahead, bends or dips which could restrict your view, and signs or road markings that prohibit overtaking. Make sure you can see that it’s safe to complete the manoeuvre before you start to overtake. These are small battery powered vehicles and include wheelchairs and mobility scooters. Some are designed for use on the pavement only and have an upper speed limit of 4 mph (6 km/h). Others can go on the road as well and have a speed limit of 8 mph (12 km/h). They are now very common and are generally used by the elderly, disabled or infirm. Take great care as they are extremely vulnerable because of their low speed and small size. Although cars are the least likely to be affected, crosswinds can take anyone by surprise. This is most likely to happen, after overtaking a large vehicle, when passing gaps between hedges or buildings, and on exposed sections of road. Crosswinds can blow a motorcyclist or cyclist across the lane. Passing too close could also cause a draught, unbalancing the rider. Large vehicles may throw up a lot of spray when the roads are wet. This will make it difficult for you to see ahead. Dropping back further will move you out of the spray and allow you to see further, and increase your separation distance. It takes longer to stop when the roads are wet and you need to allow more room. Don’t follow the vehicle in front too closely, or overtake unless you can see and are sure that the way ahead is clear. Large vehicles can hide other vehicles that are overtaking, especially motorcycles which may be filtering past queuing traffic. You need to be aware of the possibility of hidden vehicles and not assume that it is safe to emerge. Sometimes large vehicles may need more space than other road users. If a vehicle needs more time and space to turn be prepared to stop and wait. There might be pedestrians crossing from in front of the bus. Look out for them if you intend to pass. Consider how many people are waiting to get on the bus - check the queue if you can. The bus might move off straight away if no one is waiting to get on. If a bus is signalling to pull out, give it priority if it’s safe to do so. When turning, long vehicles need much more room on the road than other vehicles. At junctions they may take up the whole of the road space, so be patient and allow them the room they need. It’s very frustrating when your separation distance is shortened by another vehicle. React positively, stay calm and drop further back. Motorcyclists are affected more by windy weather than other vehicles. In windy conditions, high-sided vehicles cause air turbulence. You should keep well back as the motorcyclist could be blown off course. In windy weather, watch out for motorcyclists and also cyclists as they can be blown sideways into your path. When you pass them, leave plenty of room and check their position in your mirror before pulling back in. Try to give way to buses if you can do so safely, especially when they signal to pull away from bus stops. Look out for people who’ve stepped off the bus or are running to catch it, and may try to cross the road without looking. Don’t try to accelerate past before it moves away or flash your lights as other road users may be misled by this signal. When turning into narrow roads articulated and long vehicles will need more room. Initially they will need to swing out in the opposite direction to which they intend to turn. They could mask another vehicle turning out of the same junction. DON’T be tempted to overtake them or pass on the inside. You must ensure that you can be seen by others on the road, but you don't want to dazzle them. Use your dipped headlights during the day if the visibility is bad. If appropriate, use your rear fog lights but don’t forget to turn them off when the visibility improves. 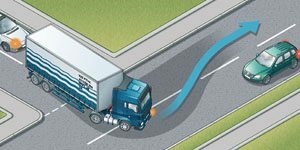 When a long vehicle is going to turn right it may need to keep close to the left-hand kerb. This is to prevent the rear end of the trailer cutting the corner. You need to be aware of how long vehicles behave in such situations. Don’t overtake the lorry because it could turn as you’re alongside. Stay behind and wait for it to turn. These vehicles are battery powered and very vulnerable due to their slow speed, small size and low height. Some are designed for pavement and road use and have a maximum speed of 8 mph (12 km/h). Others are for pavement use only and are restricted to 4 mph (6 km/h). Take extra care and be patient if you are following one. Allow plenty of room when overtaking and do not go past unless you can do so safely. Lorries are larger and longer than other vehicles and this can affect their position when approaching junctions. When turning left they may move out to the right so that they don’t cut in and mount the kerb with the rear wheels. As you approach, look out for any signal the driver might make. If you pass the vehicle watch out for pedestrians attempting to cross the road from behind the bus. They will be hidden from view until the last moment. If you want to overtake a long vehicle, stay well back so that you can get a better view of the road ahead. The closer you get the less you will be able to see of the road ahead. Be patient, overtaking calls for sound judgement. DON’T take a gamble, only overtake when you are certain that you can complete the manoeuvre safely. When following a large vehicle keep well back. If you’re too close you won’t be able to see the road ahead and the driver of the long vehicle might not be able to see you in their mirrors. At mini-roundabouts there isn’t much room for a long vehicle to manoeuvre. It will have to swing out wide so that it can complete the turn safely. Keep well back and don’t try to move up alongside it. A lorry may swing out to the right as it approaches a left turn. This is to allow the rear wheels to clear the kerb as it turns. Don’t try to filter through if you see a gap on the nearside. You should take extra care when you first encounter trams. You will have to get used to dealing with a different traffic system. Be aware that they can accelerate and travel very quickly and that they cannot change direction to avoid obstructions. Towing a large trailer or caravan can greatly reduce your view of the road behind. You need to use the correct equipment to make sure you can see clearly behind and down both sides of the caravan or trailer.